Our curriculum this year challenged students to strive to new levels of learning in all areas, all while placing a strong emphasis on social-emotional development. Our first quarter was themed around building integrity and focused on sense of self and sense of place. Children made self-portraits and told personal stories. 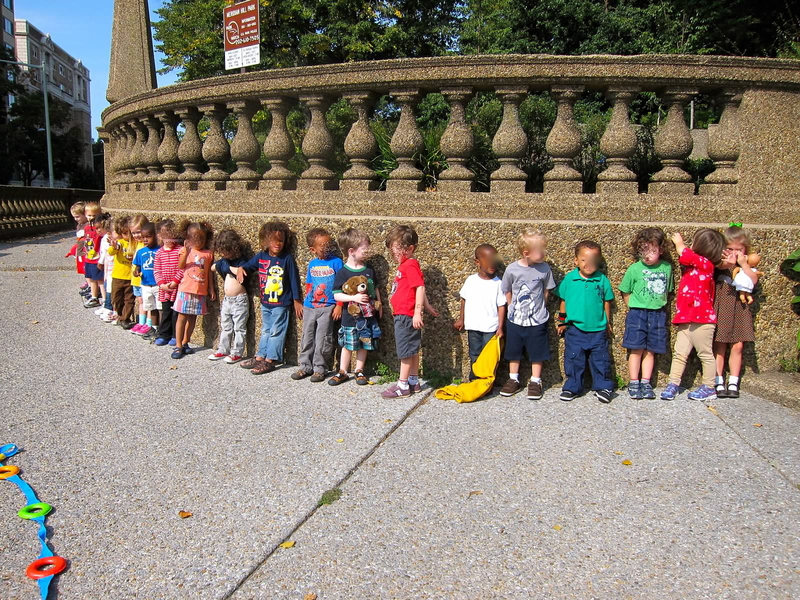 We also took observational walks to get to know our neighborhood and the people in it. Books, activities, and games focused on helping children to understand themselves and their place in the community, as well as to forge friendships and build community as a class. 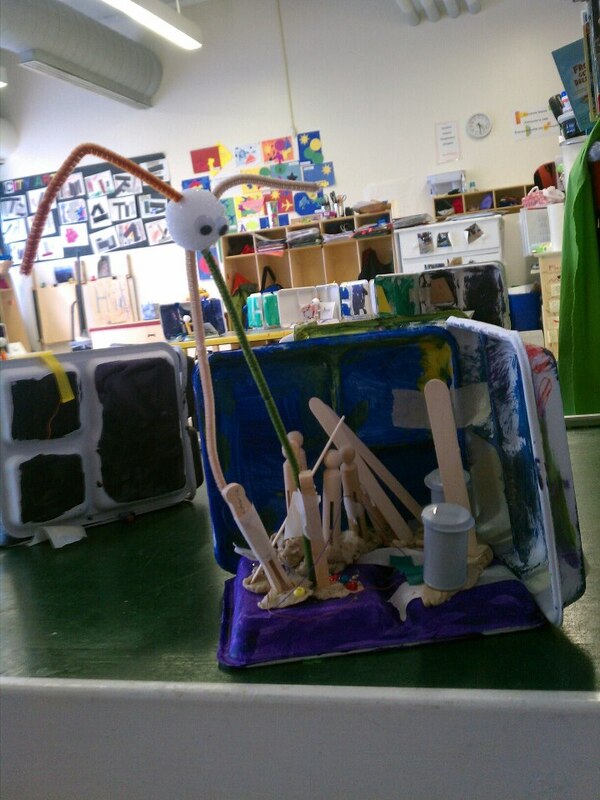 Our second quarter was themed around inquiry and focused on curiosity, exploration, and trial and error. We brought in lots of different mixtures, including gak, ooblek, and play-doh, and let the children take part in making them. These concoctions were made available on a daily basis for children to experiment with and explore. A second major focus of the quarter was on invention projects. Students thought of problems they would like to solve. 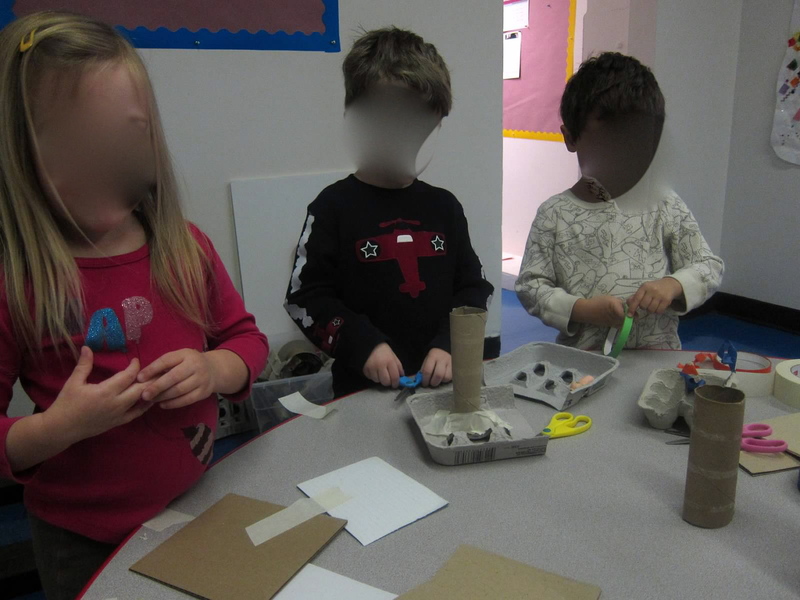 They then drew plans for machines to solve said problems and built models of their designs using recyclables and found objects. Our third quarter was themed around imagination, and focused on storytelling and superheroes. Students studied heroes, both real and fictional. They compiled a list of heroic attributes, with a particular emphasis on bravery, kindness, and helping the community. Together, they came up with a definition of what makes a hero heroic and worked hard to hold each other to these high standards, making each other into heroes of our own classroom community. As a culminating project, students made hero dolls and dioramas, wrote stories about their invented heroes, and made capes. Our fourth quarter was themed around intellect, and focused on cooking, nutrition, and food science. Students explored individual ingredients and their effects on each other. 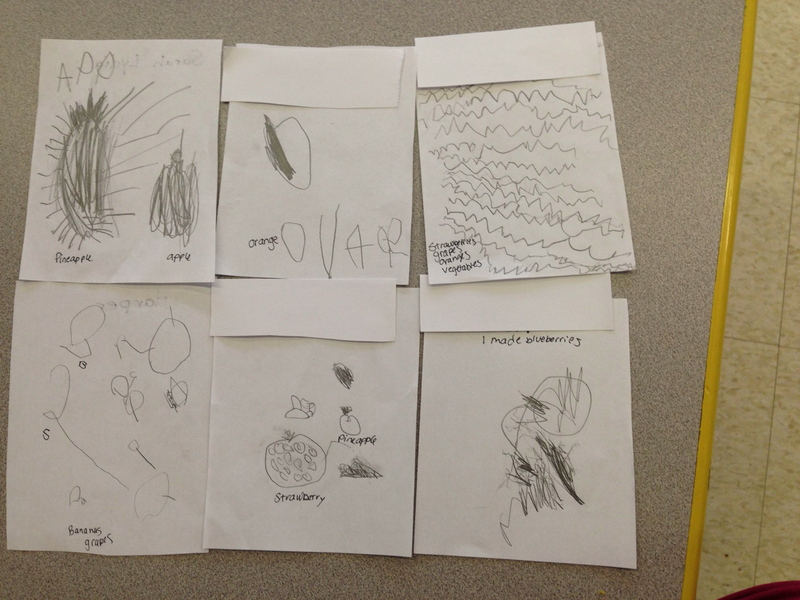 As a class, we made lists of what we know about certain foods and what we wonder. Together, we would explore these curiosities as we experimented with flavor, texture, and structure of food while cooking in small groups in class. 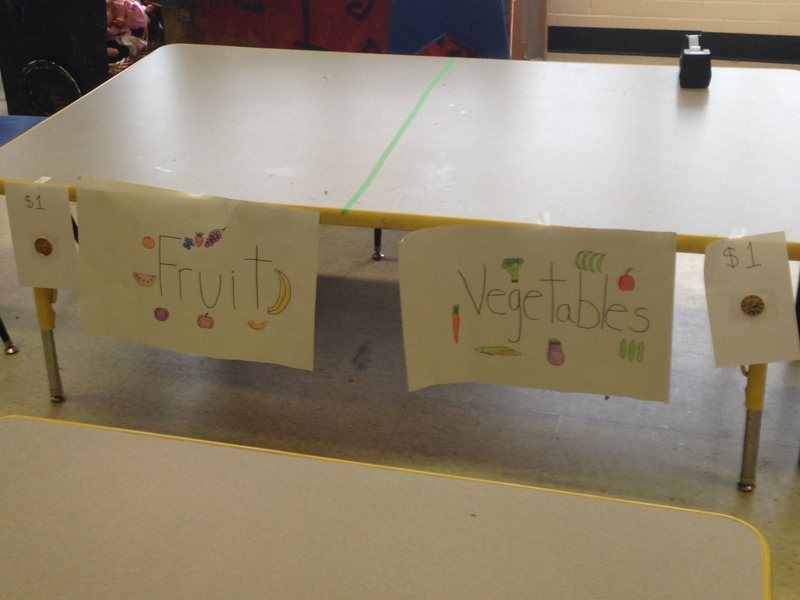 We also had an in-class mock farmers’ market, in which students were challenged to “buy” themselves a balanced snack by making selections from the fruit, vegetable, and grain tables. They bought their snacks with allotted toy coins and practiced addition and subtraction within sets of five. 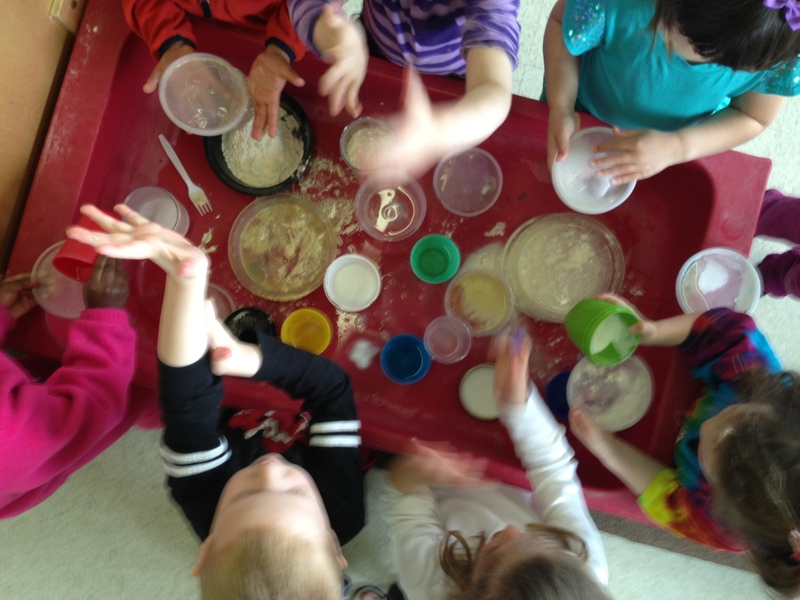 Children explore what happens when various ingredients from pancakes (flour, salt, water, baking soda) are mixed. 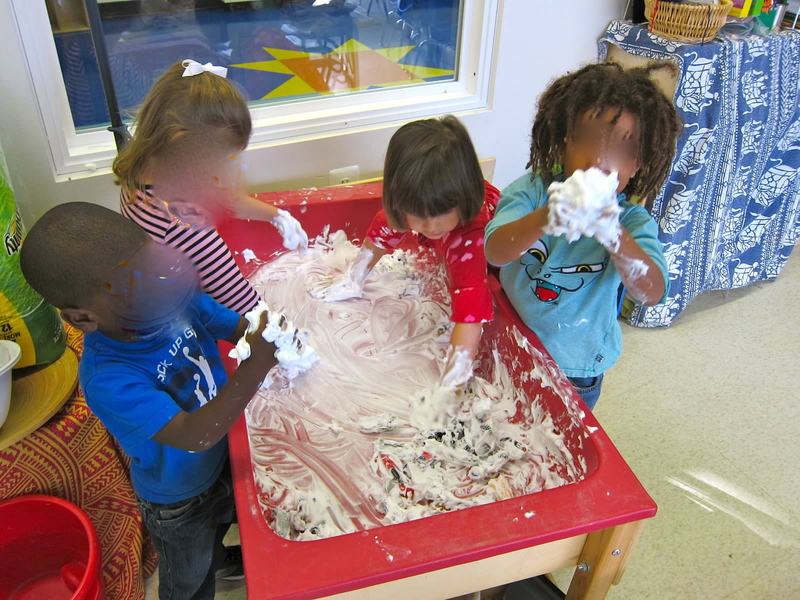 Our curriculum is inquiry-based, student-centered, and encourages play. Social-emotional development is given high priority and treated as if it were its own content areal Students are held to the highest levels of achievement in all areas, while being given the space to explore and develop their learning in their own way. Choices for topics of focus are made based on the interests demonstrated by the class. Students are assessed using Teaching Strategies:GOLD assessment data. We measure students’ progress in mathematics, literacy, speech and language, social-emotional, and cognitive development. We use this information to drive our instruction, changing plans as the students’ abilities and needs dictate. All students have the right to learn and have the ability to learn, regardless of language, abilities, or backgrounds. Success is a very individual thing. Success means growing from where you started. It means reaching a level that was previously out of your reach. This means something different for every student. Additionally, every student has unique factors that shape and drive his or her performance and behavior in school. I set high standards for the class as a whole and work hard to get each student to meet these standards. This means acting with regard and respect to each student’s personal and cultural assets, as well as each student’s personal and environmental issues. I aim to meet the individual needs of students and give them what they need to be successful. This means differentiating lessons and activities, and providing more support or more challenges as the situation warrants. This also means being sensitive to all needs, like hunger, lack of sleep, or the need for an outlet in the form of physical activity. I aim to bolster assets while providing for needs so that each student has what he/she needs to be successful. Activities and projects are differentiated to suit the different needs of individual students. Everyone is expected to complete projects with care and effort, to the best of his/her abilities. Students who need extra support are welcome to do slightly modified versions of activities, but are still asked to share their thinking and challenged to persist at tasks and attempt to reach new levels. They are also given extra time and one-on-one support. Students who are excelling at a faster rate are given more challenging tasks to attempt and invited to help support friends who might need extra help. Another way that I ensure that diverse learning needs are being met is by making sure to have a variety of modalities in every lesson that I plan. I often refer to Gardner’s Multiple Intelligences and make sure that morning meetings, activities, and projects speak to many, if not all of each of the different intelligences. I also make some classroom management decisions based on these different ways of learning. For example, I sing all of my transitions to cater to my musical learners. I also incorporate big-body movement and dramatic play into whole-group instruction so that students who learn in a bodily-kinesthetic manner can move like they need to while also taking in new information. Students “wrote” shopping lists for smoothies. Students with further developed writing skills attempted to form letters and spell words. Others attempted to make drawings that looked like fruit. Those with less developed fine-motor control did their best to draw or mock-write and then shared their ideas to be recorded by a teacher.